When B&OI and BarclayDean merged last year, one of the things that the B&OI associates were looking forward to was the philanthropic nature of our new counterparts. 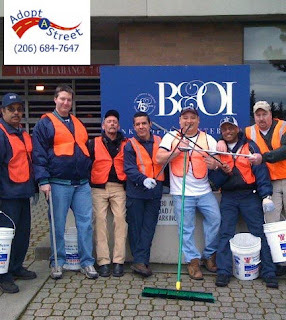 BD was known throughout the Bellevue and Seattle region as a very giving organization and devoted to the programs they were a part of. From Junior Achievement to Youth Eastside, Swedish to Providence Hospitals – we have maintained that level of dedication to continue our effort to support our community. As a company, a locally owned and operated company at that, we feel we have a duty and our proud to give back. However, each company is different in what they can provide (a start-up versus an established 20+ year company may not have the resources to attend a dinner gala where tables start at $3000). But getting your company behind a few causes or local events is a great way to not only help out, but also promote team building. Here are just a few examples of things you can incorporate into your company culture. 1. Charity races and walkathons. These usually take place on the weekends and can be a great way to promote bonding and fundraising. Maybe the company can pay half entrance fee for each runner. Maybe you do internal fundraising for a select team. There are so many different races that benefit research and non-profits, you can reach out to employees and ask which organizations they want to donate to and plan accordingly. 2. YWCA / YMCA donations – Our local YWCA does an amazing job collecting donations around the holidays for children and families. From Valentine’s baskets to Thanksgiving baskets, you can have you office adopt a family to help out. Donate 1 basket or donate 20. There are many charity organizations that do this and doing a google/bing/yahoo search of the area can bring you in contact with one. 3. Bowlathons/Golf Tournaments – currently, B&OI/BD has partnered with Junior Achievement (www.jawashington/bowling.org) to raise money for their educational programs (and their organization is international, so there may be a branch in your area). But I also know that Sleep Country USA partners with the local foster care program -another worthy and great cause (http://www.pajamabowl.com/)! Each individual raises money to meet the team goal and bonds over brews and bowling. Or why not check out which local charities are holding a golf tournament? We know of quite a few in our region that hosts for a specific cause and are also a great time! 4. Habitat for Humanity – I know if seems obvious, but this could be a great way for your company to give back. Why not offer a paid day off for your office to go build a house for a local family in need. It offers your workers a way to get away from the daily grind and work together for a great cause – almost like a retreat without the scavenger hunt. There may already be organizations/non-profits that you’re thinking about supporting – this is a great way to give back to your community and tie it in to your company culture. Make that 12K race an annual tradition! Know that every year around the holidays, you will hold a coat drive. Simple things make big differences and giving back to your community makes you feel good.